The United States Congress designated the San Pedro Parks Wilderness (map) in 1964 and it now has a total of 41,305 acres. All of this wilderness is located in New Mexico and is managed by the Forest Service. San Pedro Parks Wilderness began as a Primitive Area, established by the Chief of the Forest Service in 1931. In 1941 the Secretary of Agriculture classified it as a Wild Area and set its acreage at 41,132 acres. It became the San Pedro Parks Wilderness as part of the original Wilderness Act in July 1964. Although the elevation averages 10,000 feet above sea level, San Pedro Parks Wilderness is known for high, moist, rolling mountaintops with numerous meadows and large grassy "parks." Dense stands of Engelmann spruce and mixed conifers compete for space with small stands of aspen. 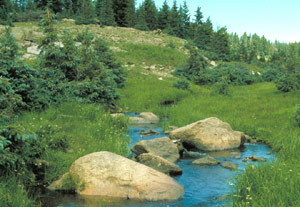 Clear streams wander through the forest openings and are usually abundant with trout. Be prepared for frequent afternoon rainfall in July and August. This rainfall enables the meadows to flourish with bluegrass, oat grass, sedge, rush, and Rocky Mountain iris, only to be covered with snow come November. The Continental Divide National Scenic Trail crosses through the Wilderness from Cuba, NM to the Carson National Forest. Its route follows along Los Pinos, Vacas, Penas Negras and Rio Capulin trails. Campsites with abundant water appeal to backpackers, as do the nine major trails. Trails receiving the heaviest use are the Vacas Trail to San Pedro Park (10.69 miles) and the Palomas Trail (3.63 miles), which joins the Vacas Trail. Fall brings hunters seeking elk, deer, bear, and grouse. San Gregorio Lake is a small irrigation reservoir in the southern part of the wilderness which was created before Wilderness designation. The Wilderness receives approximately 35 inches of precipitation a year, mostly as snow. May and June are generally dry months with little precipitation. Daytime temperatures during the summer are often in the seventies but nights are cool, sometimes cold. The Wilderness is open to cross-country skiing and snowshoeing. Planning to Visit the San Pedro Parks Wilderness? How to follow the seven standard Leave No Trace principles differs in different parts of the country (desert vs. Rocky Mountains). Click on any of the principles listed below to learn more about how they apply in the San Pedro Parks Wilderness.